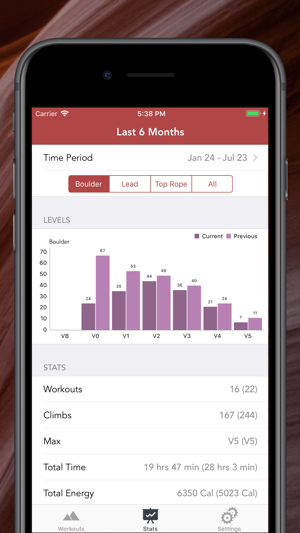 Log your Rock Climbing workouts on Apple Watch or iPhone. Only one tap to log a climb and one long tap to log an attempt. Track your progress at the gym, capture heart rate information, calories burned and analyze and compare the workouts on your phone. 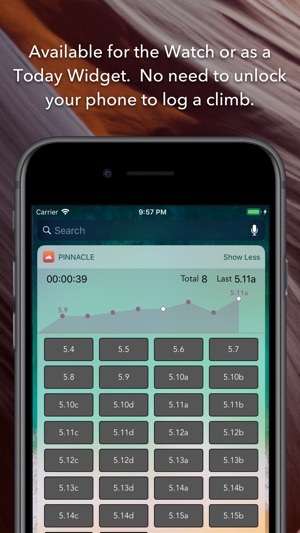 The Today Widget allows you to track your climbs without having to unlock your phone. The Apple Watch app works completely offline, leave your phone in your bag and sync your workouts when you're done. 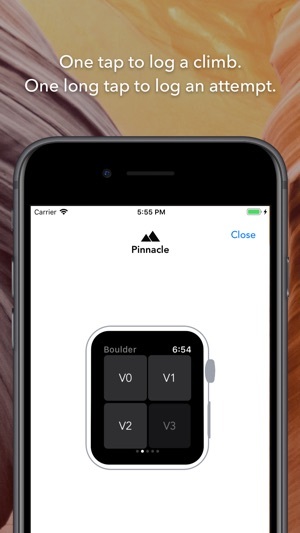 Pinnacle integrates with the Activities and Health App on your phone to show your heart rate during your climbing workouts and contribute to the Activity rings. 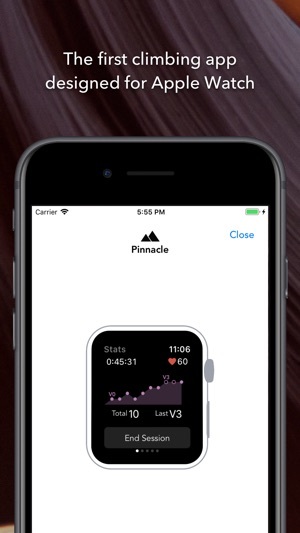 Pinnacle can also track the location of your workouts using the GPS on your Apple Watch or iPhone if available. Sync your workouts to your Strava profile including heart rate, energy burned, location, and max difficulty. One time purchase includes unlimited syncing of climbs. Works with Boulder, Top Rope, Lead, and Trad routes. Supports the Hueco V, Fontainebleau, Dan-Kyu, and Brazilian scales for bouldering and the Yosemite Decimal (USA), France, UIAA, Great Britain, Australia, Brazilian scales for rope climbing. New: Touch and drag on the chart to view each level climbed. Works great, room for improvement. The app works great on my Apple Watch Series 3. You start a session and tap the route difficulty after your climb to log it. Heart rate is tracked and workouts/calories are credited to your Apple Health data if you want. Super simple, but there is room for improvement. Sometimes I’m so exhausted after a climb that I forget to log the route. It would be very useful if the app could detect when I stop descending and give me a vibration to remind me to log the route. Even better, the app could take the approach that the Ski Tracks app uses to track skiing - it auto detects when you’re going up and down, logging metrics like vertical descent, descent rate, descent time, etc so you can get a nice overview of each of your runs. If that model was adopted, you would be able to see how you are progressing on a particular route over time (ie, am I climbing it quicker, how high did I climb on failed attempts, etc). Overall, would recommend 5/5 and I’m excited to see how this develops. Thank you, this is really great feedback! I’d love to get your feedback on the beta version of the app as I add features. If this is something you’re interested in please message me through the contact button in the app! Just started climbing a couple months ago, and the thought of keeping a log book for the gym sounded tedious. The tie-in with the watch to provide an idea for activity, combined with the ability to log sessions, is amazing. One thing I’d like to see is being able to switch from bouldering to top-roping, as my gym has autobelays that make switching from bouldering to top-roping extremely quick. In between sets of boulder problems, I usually get in a nice easy route like a 5.7/5.8. It’s certainly helped my endurance, and would be nice to be able to log that without having to end and begin sessions. Even without that, it’s still a 5-Star app! Hey wkfink! Thank you for the kind words. 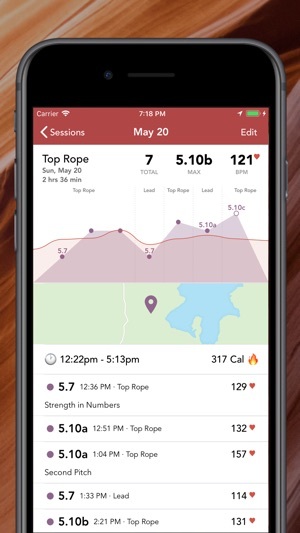 The app now has the ability to switch between disciplines like top rope and boulder during a workout. If you have workouts you would like merged please email me through the app using the "Contact the Developer" button.